When I was scanning the Chronography of 354, one part of the book was The fourteen regions of Rome. This listed all sorts of monuments, and I was reminded today of a mysterious monument named the Septizonium. It appears on the fragments of the ancient marble map of Rome that I was talking about earlier. The septizodium stood on a corner of the Palatine hill in Rome, adjacent to the Circus Maximus and overlooking the Via Appia. It was erected by Septimius Severus, according to the Augustan History. It was just a facade, rather like the buildings on a classsical stage. The idea was to put an impressive frontage onto the imperial palace on that side. It had no architectural purpose other than appearance. At the renaissance some quite impressive remains still stood. Pope Sextus V knocked them down for stone, as the humanists of that period tended to do. The notes on the university website mentioned that images of it existed in renaissance prints; and I wondered if there were any online. And there are! Here’s one that I found online via Google images, although I was quite unable to locate the source webpage that it was embedded in. Thank you, tho, whoever scanned it. Another excellent image is here, image url here, which gives a real sense of what the ruin must have looked like, complete with its ceilings. I wish… I wish we could see these buildings today, even as they stood in 1500. UPDATE: Bill Thayer has a scanned article on the building here. 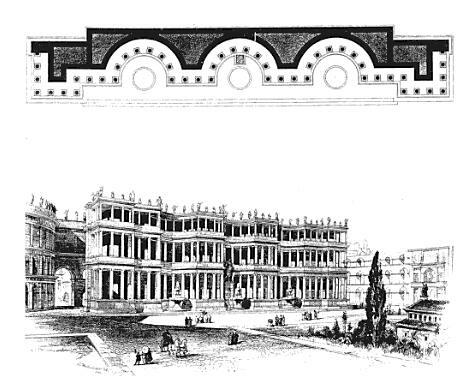 The Historia Augusta chapter on Severus tells us about the building of it. 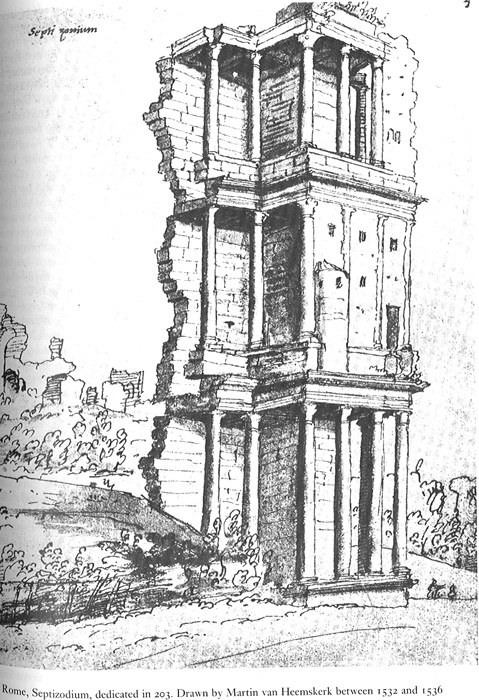 UPDATE 2: According to Michael Grant, the remains were demolished by Domenico Fontana in 1588/9. Archaeology confirms that it consisted of three recesses, with a wing on either end. Somewhere along it were seven niches, each containing the statue of a planetary deity (which is probably the origin of the name). A fountain was also involved. Raffaello Fabretti’s 17th century De aquis refers to “the Septizodium, the remains of which used to be visible in the memory of our fathers between the Caelian and the Palatine”. Some references to pictures of the monument are here. I’ve also found references online to “demolition records” extant today which specify what sort of materials it was made of. These were compiled by Fontana. Here is a reconstruction of the plan and appearance of the building. UPDATE: Christopher Ecclestone has drawn my attention to a splendid article on the whole subject, with images and bibliography, exists by Susann L. Lusnia, Urban planning and sculptural display in Severan Rome: reconstructing the Septizodium and its role in dynastic politics. American Journal of Archaeology 108 (2004) p.517-544. This contains all this and more and is highly recommended. Thank you – and a very interesting article. Are there any photos of those strange temples? Did you click on ‘Kalybe Temples’ in the penultimate paragraph? That’s the best source/reference I know. Will look again – thanks! Repeat after me, Roger: rekeyed, not scanned…. Roger, make sure to delete that last comment (and don’t click on the link), it’s spam! Don’t worry – every morning I awake to a bunch of this evil. It lasts no longer than I can get to my computer.